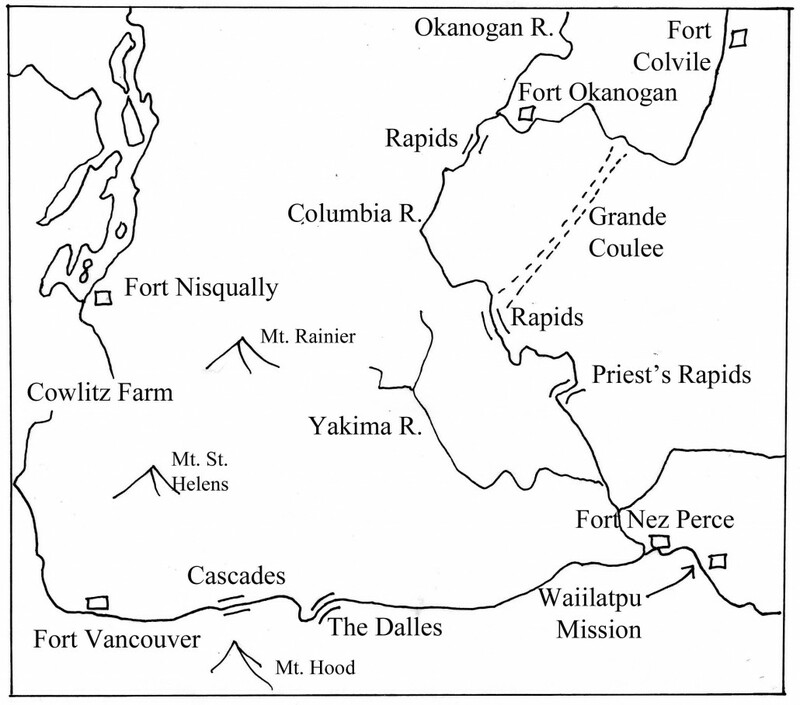 Map, Fort Vancouver to Fort Colvile, showing the passage through the Cascade Mountains where the Cascades and The Dalles appear. The two brigades leaving Fort Vancouver for the interior have had different experiences at Portage Neuf, a cluster of islands and rapids upriver from Fort Vancouver, and a few miles west of the Columbia River’s first major barrier, “the Cascades.” At Portage Neuf the brigade men had just begun their journey into the Columbia Gorge. At the Cascades, however, they began their passage through the massive Cascade Mountain Range. On their right hand loomed Mount Hood, standing 11,000 feet high. To their left the mountains lined up to create a snow-covered barrier as far as the men could see. The only reasonable way for these men and boats to make their way through this mountain range, to the deserts beyond its eastern slopes, was to follow the rapid-filled chasm that the Columbia River had created. I would love to know whether the name “Horse Point” still exists, and where it was, and why it was given that name. “9th, Saturday. Embarked at Break of Day and assisted by a fine aft Breeze, we came almost within sight of the Dalles at Six o’clock PM, when I thought it best to Encamp to avoid being pestered by the swarm of Indians who inhabit that place. One of the Boats receiving a Slight injury by striking on a shoal, which was however soon repaired, & occasioned but little loss of time. The weather continues fine & very pleasant.” The Dalles was the second massive barrier as they made their way through the mountain range. “10th, Sunday. Proceeded at an Early hour, and with much labour tho’ without accident, in ascending the Dalles, we reached the portage of that name at five o’clock PM, which was too late an hour to undertake Carrying over, as the whole of the property could not have been carried across, and the Natives were too numerous to admit of our force being divided, the whole being required to guard the Encampment which was formed by the Boats into an oblong square in the Centre of which the different Cargoes were placed, the Tents pitched, and a regular watch appointed for the Night. We here obtained a sufficient supply of Salmon for the Brigade for two days, and were also under the necessity of purchasing wood to cook our supper, an article this barren Country does not produce. What we procured brought down by the floods from the upper parts of the River, and drawn up by the Natives for their present & Winter Consumption. In the evening Mr. Finan McDonald arrived at our Encampment, having left Messrs [Thomas] McKay & [John Warren] Dease with their Men, & Property, at the East end of the Portage. These Gentlemen and Men, formed a part of the Snake Trapping Expedition under Mr. [Peter Skene] Ogden. They took their Horses to Walla Walla [Fort Nez Perces], & are now on their way by water communication, with their Hunts, to Fort Vancouver. 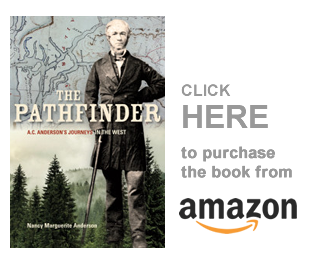 Mr. Ogden departed from thence on the 29th Ulto to proceed direct across the Mountains, to Fort Vancouver. The success of this Expedition, altho’ they encountered none of the disasters they met with last year, has not been more successful in collecting Beaver. The Country they had to pass through being destitute of large animals, And not being able to Kill a sufficiency of Beaver for their subsistence, they consequently suffered much from starvation which their appearance sufficiently bespeaks; and were obliged to return sooner than they would otherwise have done. The weather continues fine. “11th, Monday. At dawn of Day the Men commenced carrying, and by eight o’clock the Property and Boats were at the East end of the Portage, from when[ce] we departed at two. Mr. Finan McDonald’s Family being on one Boat as passengers, he expressed a strong desire of accompanying them as far as Walla Walla, from whence he consented to return to Fort Vancouver, should Chief Factor [John] McLoughlin require it. To this request I did not think proper to oppose…. You will notice that Finan McDonald’s wife and children are mentioned in this post, although we had absolutely no information previously that they traveled with this brigade as passengers. Nor is there any mention later. Women and children traveled with the brigades all the time, but they were never recorded and, apparently, traveled almost invisibly. The same was true of the York Factory Express journeys, and almost all other journals of this time. In this posting I managed to get you through the mountains to the desert on the other side — a relatively short passage but a difficult one. I think we will reach Fort Nez Perces in the next section of these journals. It does not seem as if we are going to be traveling too fast on the return journey, and of course the upriver journey was always much slower than the downriver passage to Fort Vancouver. But these men and women were also passing through the roughest and most difficult part of their journey — whether going upriver or down. This was the passage through the mountains, that began with the Cascades, was interrupted by the Dalles, and ended with The Chutes. The portages past these three barriers were long and intricate, but at Ceililo Falls, on The Chutes’ eastern edge, they would again place their boats in the water. Here we now have the story of Peter Warren Dease’s passage through the mountains in 1831. Peter is the older brother of the John Warren Dease mentioned in Connolly’s journal, but John reached the Columbia District a few years before Peter arrived here. “Monday 4 [July]. At 9 AM we left the Cascades, had aft wind. At 1 PM Louis Bellair who was sick Expired on the Boat, and at 4 PM put ashore to inter the Body which took Place at 5 in as decent a manner as means would permit, after which we proceeded until Evening. This is a very windy place, as you already know from the journals of the downriver voyages. In his York Factory Express journal, Edward Ermatinger called this windy place “Cape Horn.” Ermatinger’s Cape Horn stood on the Columbia’s south bank, 72 miles above the fort and across the River from the mouth of Klickitat River. In all other York Factory Express journals, Cape Horn was west of the lower Cascades rapids, near Phoca Rock [near Portage Neuf, west of the Cascades]. The names of places sometimes moved around as they are named and renamed by the Guides of the boats, or the passengers who traveled with them. Dease’s crew got though The Dalles quickly, as his next days journal says merely: “After sunset put up near John Days River. Very warm weather.” We will look forward to picking up his story in the next section of this stream. There are still several Cape Horn place names on the north side of the Columbia, grouped west of the Cascades and east of Washougal, WA. I suspect that Horse Point was drowned with the building of Bonneville dam just downriver from the Cascades Rapids. Yes. Still famous for its wind — they do wind-surfing/sail-boarding or whatever it is called there! John Warren Dease died 11 Jan 1830, so he can’t be the Dease mentioned in Connolly’s journal of 1831. Connolly turned over the New Caledonia district to Peter Warren Dease in the spring of 1831, according to DCB. So confusing to have both brothers involved in the fur trade! Yes, its Peter in Connolly’s journal. But in 1828 John went out with the express, and it may have been him that met Simpson at Norway House, in Archibald McDonald’s journal. I’ll take a bet it was Peter, though. There’s an appendix to this book that has the name, but I didn’t copy it out.